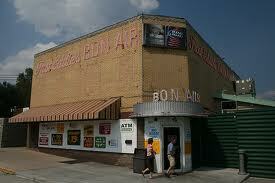 If you’ve ever listened to St. Louis radio, then you’ve certainly heard about Fast Eddie’s Bon Air in Alton, Illinois. They claim to have 40 people celebrate their 21st birthdays at their bar every day and claim to have the coldest beer in the area. So does this dive bar 45 minutes away live up the legend? The answer: not on a Wednesday at 3pm. I drove 45 minutes to go to this?!?! The bar is humongous, as Eddie keeps buying nearby properties and turning them into parking lots, which now are acres large. On a Wednesday afternoon, the closest parking lot was actually full. Even though the bar sells food, you must be 21 to enter with absolutely no exceptions. This hard rule probably adds to the mystique of the bar. Upon entering the bar, I got a beer, which was very cold, but also very expensive: $4.50. That said, the food, which is served nearby is incredibly cheap and you can get unlimited free popcorn. The famous Big Elwood sausage is only $3. So, I suppose it evens out. There was also a live rockabilly band, which was mediocre. While my experience at Fast Eddie’s wasn’t amazing, it was most likely due to the timing, as I was the only person who wasn’t a washed up trucker in the entire place. I am certainly going to try again on a weekend because a bar doesn’t become this famous for being mediocre.